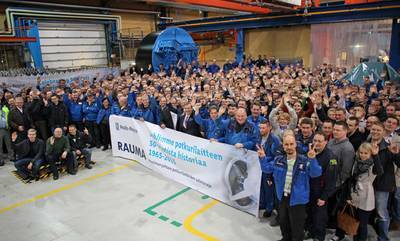 Marking 50 years since the delivery of its first azimuth thruster, Rolls-Royce held an event in Rauma, Finland to celebrate the occasion. Azimuthing thrusters, which today are one of Rolls-Royce’s most successful marine products, rotate through 360 degrees, providing propulsion and maneuverability, without the need for a rudder. Azimuthing thrusters power and position some of the world’s largest floating structures. The Pioneering Spirit, the world’s largest construction vessel, will be powered by 12 Rolls-Royce azimuth thrusters when it enters service on decommissioning duties in the North Sea later this year, Rolls-Royce noted. Joining Rolls-Royce employees to mark the occasion were the company’s chief executive John Rishton and marine president Mikael Makinen.